Federal Court Justice Max Teitelbaum ruled that Judge John Gomery demonstrated bias towards former Prime Minister Jean Chretien during the sponsorship inquiry. Last Thursday, Federal Court Judge Max Teitelbaum voided certain parts of the Gomery Inquiry’s conclusions that related to Jean Chrétien because of what Judge Teitelbaum ruled was bias on the part of Judge Gomery against the former Prime Minister. Judge Teitelbaum focused on comments made by Gomery that, in Teitelbaum’s view, evidenced bias. He was scathing in his assessment of Gomery’s conduct as the head of a public inquiry. Teitelbaum said Gomery failed in his essential duty to ensure that a reasonable person would find the proceedings to be fair and impartial. “The nature of the comments made to the media are such that no reasonable person looking realistically and practically at the issue, and thinking the matter through, could possibly conclude that the commissioner would decide the issues fairly,” Teitelbaum said. Two of our editors were the first in the media to write openly on the very issues that Judge Teitelbaum ruled on. Then- editor Jim Duff and current editor, and then columnist, Beryl Wajsman. The Suburban was one of the few media outlets that published criticism of the inquiry for bias, and not based just on Judge Gomery’s comments, but on his actions. The Suburban was ahead of the curve on this story. Two analyses in particular are noteworthy. One was written in November 2005 by Duff and Wajsman entitled “Not in Gomery? It doesn’t exist.” The other was “Hey Canada, can you handle the truth?” written by Wajsman in March 2005. Among the biases Duff and Wajsman highlighted was Judge Gomery’s astonishing statement that “…we pretty well know what happened even though we still have 70 days to go…” This was one of several comments made during the proceedings that shocked Judge Teitelbaum. Not only did he feel such comments were inappropriate at any time, but he questioned how could a commissioner come to any conclusions before the evidence had been presented. Precisely the question Wajsman had led with in his March column. Teitelbaum felt that Gomery had poisoned the wells and was pandering to public opinion. It is worthwhile to note that if Judge Teitelbaum felt that Gomery’s comments like “small town cheap” evidenced bias against Chretien, it is reasonable to ask whether his former statement did not evidence a bias against everyone else. The words of Jim Duff and Beryl Wajsman that are examined in “Ahead of the curve” are as starkly relevant today as they were when they were written. Among the critical questions they raised, and that remain unanswered until today, is why certain people were never called as witnesses. Some of these people worked for, or were allied with, Paul Martin.The importance of them not being called goes to the heart of the reason for the Gomery Commission. Martin had said he was “mad as hell” at the alleged improprieties in the sponsorship program and that a public inquiry was necessary. He also said he never involved himself or his staff in the program and if it was shown he did he would resign. Despite testimony of involvement by him and his aides, Paul Martin went no further than a belated admission that he should have kept himself better informed since he was not only the Finance Minister, but as Deputy head of the Treasury Board, he was responsible for signing off on funding the initiative. 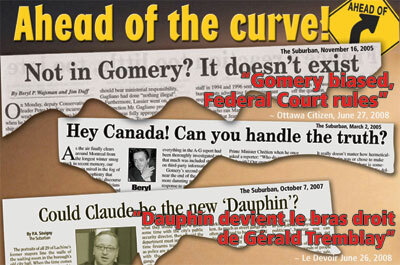 A profound issue was never examined in Gomery`s failure to look into the allegations of Power Corp.’s intervention in raising the line of credit of the Liberal Party of Canada’s Quebec wing. Were the services rendered by Power Corp. declared as “considerations in kind” to the LPC (Q) as Justice Gomery had asked of so many of the corporations involved in the Inquiry? Why the double-standard inherent in not examining Power’s role? It is instructive to note that Prime Minister Martin’s senior dollar-a-year advisor was Maurice Strong, a former Vice-Chairman and Board member of Power Corp. And Power Corp.was of course instrumental to Mr. Martin’s taking control of Canada Steamship Lines. Canadians never got an inquiry into the reported $167,000 in Canada Steamship Lines contracts awarded during Mr. Martin’s tenure as Finance Minister turned out to be $167,000,000 in reality. Nor why there was no inquiry into the CSL affiliates transferred to the tax haven of Barbados that, according to Radio-Canada’s “Enjeux” documentary, avoided $300,000,000 of Canadian taxes by taking advantage of rule changes enacted. Those questions were beginning to appear regularly in the press just before the naming of the Gomery Commission with its narrow mandate. Too bad. The Inquiry’s final report too often presented conclusions based on questionable evidence using subjective language that allowed politicians and media to smear many who were not even blamed for anything. The arguments of Sylvain Lussier, then counsel for the Attorney-General of Canada, that Duff and Wajsman highlighted, are important in light of Chretien’s successful challenge because they were similar to those put forward at the time by many independent observers. His words beg the question of whether the mandate of the Gomery Commission was tooled as a political settling of accounts between warring factions within a party. Yes, improper billing practices by ad companies were brought to public light. But those companies were already being investigated at the time by police authorities. Investigations had to be restarted precisely because the Commission sidelined the process. The false amounts were a great deal less than the questionable dealings that were not investigated by any Commission. Indeed they were half the cost of the Commission itself. Padded bills are one thing, but we still don’t know who in government authorized their payment. The only goal truly seemingly accomplished was bias to the reputations of many innocent people. And if reputations of the innocent were smeared by politicians based on biased conclusions from the Inquiry, what does that say about the whole process? Hearsay and rumour played too great a part. We well remember that during questioning of Prime Minister Paul Martin, Judge Gomery cut off a line of inquiry by lawyer Pierre Fournier who was attempting to raise doubt on the accuracy and veracity of Auditor-General Sheila Fraser’s report and determine if Martin knew more than what was in it. After several stop-and-go attempts, Gomery finally blurted out that it was common knowledge that not everything in the A-G report had been thoroughly investigated and that much was included strictly on third-party information. Gomery’s remark should have put into question the legitimacy of the whole process from the day that Fraser released her “revelations”. And Fraser’s role was never examined. Why was the sponsorship initiative, which according to two previous Auditor-General’s reports had seen its problems corrected, given such a grandiose rebirth with recycled facts — that excluded only the corrective measures in place — spiced up by language so extreme that Sheila Fraser was criticized even by her own national professional body? Another question we’d like to see answered is when was it decided that federalist propaganda was so illegitimate as to require a national commission costing $80 million to find $1.1 million that allegedly went to Liberal party coffers (one percent of the original amount speculated), yet the cost overruns of $1 billion in the gun registry; the bilking of National Defense by Hewlett-Packard of $165 million; and the millions of dollars of contracts to Prime Minister Martin’s firms and friends warranted no scrutiny? You may not have read much of this in many of your daily newspapers but we are proud you could read it in the pages of The Suburban. Because the greatest bias demonstrated by the Commission was that done to the rule of law in this country where power is exercised without legitimate moral authority and wielded with a double standard it is corrupt. Former Justice Minister Irwin Cotler pleaded in Parliament, and in cabinet, for due process to be respected through the hearings. But what happened in the end was that Charter guarantees of fundamental justice were compromised, the presumption of innocence abandoned and the rule of law prejudiced. Nothing was worth that.